WASHINGTON — President Trump promised big changes to skyrocketing drug prices during Tuesday’s State of the Union Address, but his words are empty considering his pick to execute the job, Health and Human Services Secretary Alex Azar. 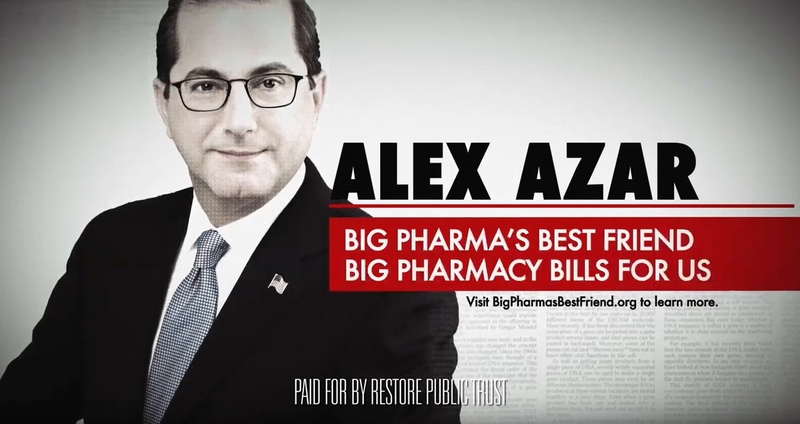 A new TV ad from Restore Public Trust highlights Secretary Azar’s history as a pharmaceutical insider, proving he is the wrong person for the job. The 30-second ad spot, which launched online today, will begin airing in DC on Fox News, CNN, and MSNBC on Thursday. The ad is the first campaign of a longer-term effort by Restore Public Trust on drug pricing. Azar questioned the Trump administration’s ability to lower drug prices before he was tapped to carry out its plan. Now, more than a year into his job, drug prices are soaring. Last year, Pfizer announced plans to hike prices on 41 of its drugs while AbbVie announced a proposal to buy back $5 billion in stocks. Azar’s history only further underscores his credibility when it comes to helping real people cope with the rising prices of their prescriptions. During Azar’s tenure at Eli Lilly, drug prices were repeatedly raised. Insulin prices for diabetes patients skyrocketed, resulting in an investigation and class action lawsuit for price fixing. As a drug company executive, Azar opposed action to reduce drug prices, ensuring prices stayed high. Forteo, a drug for osteoporosis, rose by 68% between 2012 and 2015 alone. It was the single highest retail price increase for a specialty drug of its kind according to the AARP.